Do Hurricanes have Lightning and Thunder? Hurricanes can have lightning and thunder but not often. Normally hurricanes do not have lightning and thunder because lightning and thunder are formed by vertical winds that cause water and ice to rub together. This friction creates the electrical field that causes lightning and thunder. Hurricanes normally do not have the vertical winds needed to make the electrical fields. Most hurricane winds are horizontal. So hurricanes do not normally form lighting because the vertical wind churning does not often happen. However during the 2005 Atlantic Hurricane Season - Hurricane Emily, Hurricane Rita and Hurricane Katrina all had extensive lightning and thunder. these were all powerful hurricanes - Hurricane Emily was a category 4 and Hurricane Katrina and Hurricane Rita were category 5 storms. Hurricane Emily was explored using an ER-2 aircraft which actually saw the lightning in the high cylindrical walls surrounding Hurricane Emily's eye-wall. The lightning in Emily was both cloud to cloud and cloud to ground and happened a few times per minute during the observation. 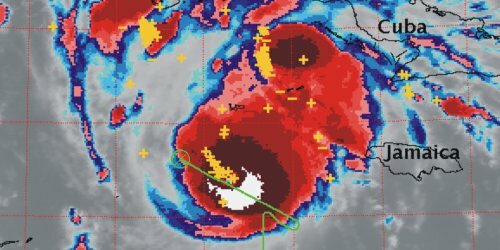 The electrical field above Hurricane Emily was an amazingly steady field in excess of 8 kilovolts per meter which is equivalent to a major thunderstorm over land. Hurricane Katrina and Hurricane Rita were observed from afar with long range sensors on the ground. NASA scientists are still unclear what caused these hurricanes to have lightning and thunder when most hurricanes do not. To read the full NASA story visit Electrical Hurricanes at NASA's website. Some more facts about lightning.